SAM Fan Filter Units and Light Fixtures are equipped with power cords for plugging into receptacles mounted on a top cross rail. 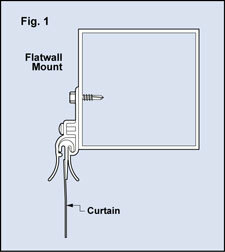 Receptacle(s) are connected to flexible conduit which connects to a field connection junction box. 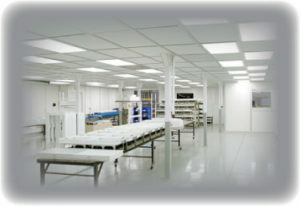 A qualified electrician can then connect the host building power to the QS Softwall Cleanroom. A control box mounted on a leg is equipped with switches for the SAM Units and Light Fixtures. The number of switches will be appropriate or in direct proportion to the number of SAM units and light fixtures. Connecting to the building power source and compliance with state, city, county or township codes is the responsibility of the buyer. Flexible Solutions Softwall Cleanrooms are considered a piece of equipment and are in compliance with accepted national practices for wiring of equipment. Lead time for the electrical option requires an additional 5 business days. Consult with the factory for more information. Adding a Caster Package permits the Softwall Cleanroom to be moved from one location to another. All casters are polyurethane swivel type and are equipped with brakes (Fig. 2) to prevent movement when the cleanroom is in use. 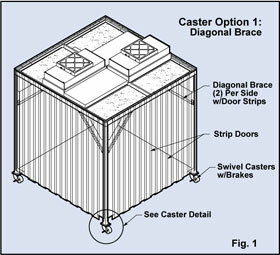 To insure stability during a move, Caster Option 1 includes up to (8) Diagonal braces (Fig. 3). 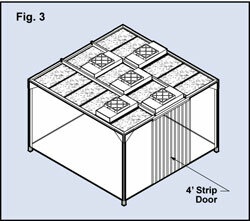 Cleanrooms with 1-4 sides consisting of all strips utilize two (2) Diagonal braces per side as shown on Fig. 1. 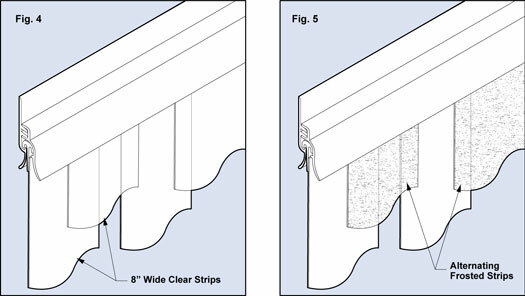 Diagonal braces can also be used on sides with solid curtains. 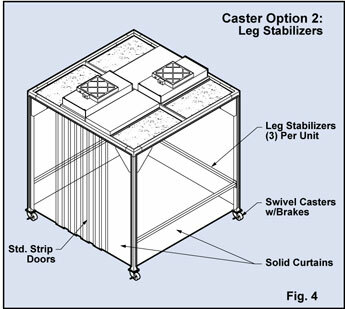 Caster Option 2 includes three (3) Leg Stabilizers for sides with solid curtains as shown in Fig. 4. 805079…………..Casters, 4” x 2” w/brake (4) req’d. Moving a portable Softwall Cleanroom may involve some risk and danger to the equipment or personnel. Observe all appropriate safety regulations when moving a Softwall Cleanroom equipped with casters. DO NOT allow personnel to be inside the cleanroom during the moving process. DO NOT attempt to move cleanroom across uneven or inclined surfaces. When moving a portable cleanroom, DO NOT use a fork lift, portable hoist, pallet jack or other lifting devices. Use at least one person per leg when moving the cleanroom. Our engineers factor in the desired velocity and choose the appropriate curtain length for each cleanroom, resulting in proper airflow relief. 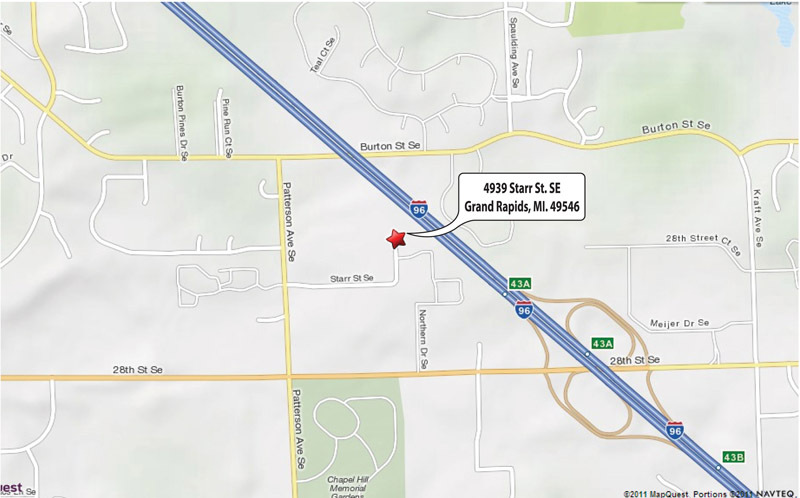 Click here for maintenance and cleaning procedures. An attractive white painted sheet metal perimeter facia (Fig. 7) prevents viewing the ceiling components from outside the room. Legs are adjusted by removing the pin, sliding the leg to another desired height, and replacing the pin. (Fig. 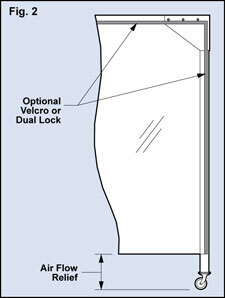 8) This feature is useful when the cleanroom must be moved through a doorway to another area. Consult with your area representative or the CRI factory for your unique requirements.